﻿ Garnet Hotel, Palawan | FROM $26 - SAVE ON AGODA! Have a question for Garnet Hotel? "Water supply is good compared to the hotel which we had during our first visit." "The Garnet is a nice mid-ranged hotel in the heart of downtown." 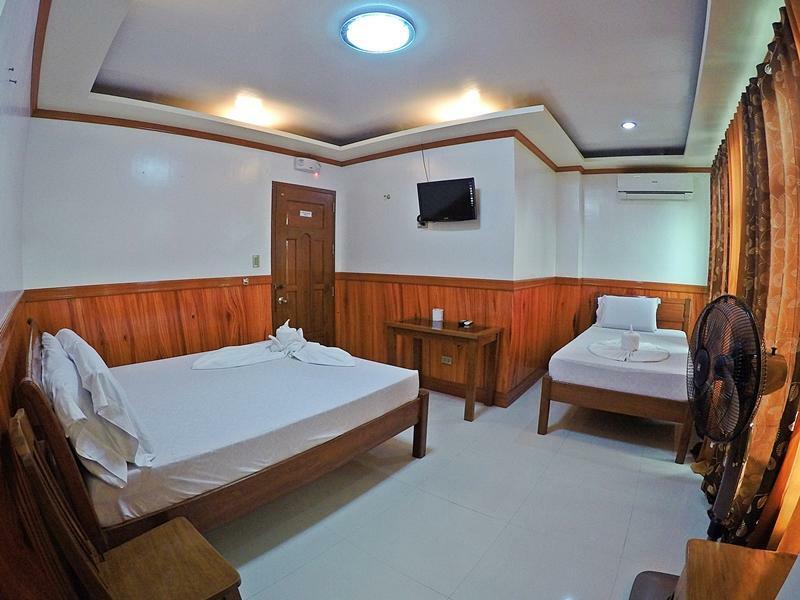 Take advantage of a wealth of unrivaled services and amenities at this El Nido hotel. To name a few of the hotel's facilities, guests can enjoy a 24-hour front desk, Wi-Fi in the lobby area, a family room, and tour assistance. Hotel accommodations have been carefully appointed to the highest degree of comfort and convenience. Guests can enjoy features such as air conditioning and a wake-up service, as well as some non-smoking rooms. The hotel offers many unique recreational opportunities such as massage treatments. 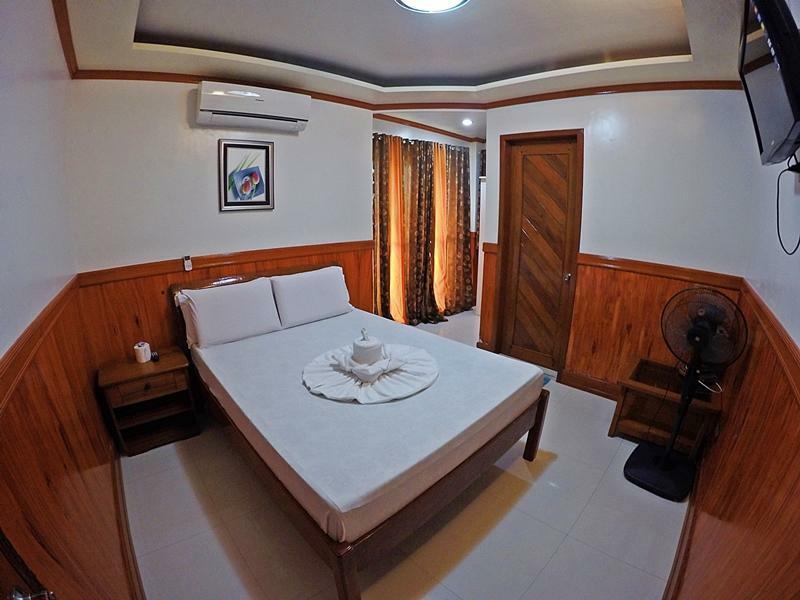 Whatever the purpose of visit, Garnet Hotel is an excellent choice for each stay in El Nido. A PHP 200 Eco-Tourism Development Fee is required for island tours and is valid for a maximum of 10 days. Tickets are sold at the tourism office and kiosk outlets. The staff is very friendly and helpful. They can help you with tours and transportation, although there are many places right outside the main door that you can choose from. Free coffee and tea in the balcony area 24/7. Many good restaurants right there on the street or out on the beach. The only one we didn't like was Squidos. Food was average, but everything cost extra; water, butter, jam or jelly for your toast, and they use a lot of bad words. (Not related to the Garner hotel) I recommend Garnet Hotel and will stay there again if I return to El Nido. Great thing about Garnet is that it is on the Main Street in El Nido where all the restaurants are. Luckily the street that it is on is closed from 5:30pm - 5:30am, so you're able to walk around in the evenings and enjoy without having to worry about Traffic. First look, you may think it's a subpar hotel but it really is a clean hotel with great location. You will always see one of the ladies sweeping away at all th sand tracked in by the tourists. Right next door, you have IBR that is open 24/7 for your hungry appetite especially if you have to wake up early for diving (2 dive shops across) ! Not the best food, but it is open for your early mornings before your dive. Garnet was actually our 2nd choice hotel. We wanted to stay at spin hostel for 4 nights, but since we couldn't stay for all 4 we did 2 nights at Garnet and 2 at spin. We regretted spin immediately and wanted to move back to Garnet, but couldn't because we prepaid. Would highly recommend! Perfect location. It was quiet and peaceful. We did not felt the supposed loud noise at all because of the construction work beside the hotel. At night, you could see people walking in the streets looking for a fun night out. The feel was almost like Pub Street in Cambodia. Just a few walks to the beach. Would definitely pick Garnet is ever we go back to El Nido. This is a nice hotel in the city center, just 100 meters from the beach and near restaurants and pubs. The rooms are clean and not small. The TV has many cable channels and there are couch and coffee areas in the center of the building on each floor. The breakfast was across the street at a restaurant and one could order breakfast from a menu. The staff was very friendly and tried to provide a good service. we had a by pleasant stay at garnet hotel! bebong and anne were very kind and helpful behind the counter, and the owner, heal, was very kind as well. the staff did whatever they could to help make our stay as comfortable as possible. the breakfast was right across the street at habibi, and was quite good. we would definitely recommend this hotel to any couple travelers. keep in mind that the electricity goes out in el nido from 6am to 2pm, so you will wake up early when the ac kicks off. the whole town seems to be up and stirring once this happens, so be prepared to wake up early! el nido is an incredible place- the scenery is amazing, and the snorkeling is very good. you must check this place out, and stay at garnet hotel- you'll be happy you did! Brand new hotel with very clean rooms. Staff is very helpful with local knowledge and advice for various activities. Great location with a 1 minute walk to beach. No need to bring alarm clock, roosters will wake you for free before sunrise. Everything was a short walk from hotel. Hotel staff available late at night, which was very convenient for late arrivals. We had a great stay at Garnet Hotel, The location was great right at the center of the town which affords convenient access to practically everything you will need. The hotel staff was always smiling and very responsive to our needs. Also, the coffee was flowing anytime of the day. I highly recommend this hotel. book ahead - there's only 9 rooms here and for the price it's a great deal. rooms have a/c and a fan, and the hotel has its own generator in case power goes out. hot water showers, free wifi and complementary breakfast in nearby habibi's restaurant (wonderful views across the bay). the staff were welcoming and very accommodating, and spoke excellent english. The staff should be more professional. When we checked in, the font desk personnel was still doing her hair. She did not even stop when she saw us and kept having her friend doing her hair. Every time we had to get the keys from the front desk, we always had to wait for the personel to accomodate us just to give us the keys. She is always loud. Even on the third floor, we could hear her laughing with some other staff. I would not come back at all. I had this place booked but when I got there they told me there was no AC. It was SO HOT in the room. I told them I can't stay there. They offered to put me in a sister hotel. They said it was the same price. Once I checked into Citrine, I saw it was 1000 peso less but they refused to credit me on the first night that I over paid in the place with no internet. The lady at the front desk was really rude and after arguing for too long, they agreed to credit me back for unused nights so I could book their other hotel for the rest of the stay to save money. They still screwed me out of the 1000 pesos for the difference in the first night. I told them I would give them a bad review for not crediting me and lying to me. They are crooks. They put me in a crappy hotel out of town with no internet, and charged me for this hotel. It was like living in a jail cell since the cable was out that week too. I stayed 4 nights at this hotel. Its location is perfect. It's near to the bay area where you board your boat for island hopping, near to nice resto, bars, convenience store, souvenir shops, etc. Hotel staffs are friendly. The hotel has a lounge on each floor where you get to interact with other guests while having your complimentary coffee/tea. Most importantly, I felt safe at this hotel. So definitely staying here the next time I will visit El Nido. Btw, they do not serve breakfast/meals. Thank you verry much sir. It was our complimentary on our service. See you again in here. The Garnet is a nice mid-ranged hotel in the heart of downtown. The deluxe room is spacious and has AC. The showers on the first floor are heated by a small electric heater good enough for a short shower. On the third floor the showers are only solar so I recommend requesting a room on the first floor (second floor if you are an American). There is no wifi in the rooms, only in the lobby, this is standard in El Nido. They didn't cleaned our room for the hole stay, dind't gave us clean towels and didn't fixed the door lock until we asked(maybe 4times). Also 1 day they run out of water even cold one so I couldn't take a shower. I would never come back again!!! We want to give an apologize for the inconvenience. Thank you. I booked a family room which should have 2 beds and when we arrived we were given a room with just one queen bed. When I pointed out the error, they said there were no other rooms available and wouldn’t give me the refund just for the difference in room rates. We were left waiting for an update at their lobby when right in front of us they gave the room to another couple. After a long discussion they eventually refunded the whole amount to us. We had to go around El Nido to look for another hotel. I suggest skip this hotel if you don’t want to arrive in the island with the risk of not having a room to stay in. Good central location and across the street to where I was diving. General standard good with daily cleaning as you'd expect. Points to note: hot water is solar provided and was rearly warm, and no where near hot. Wifi is located in lobby only. Location and price are good but water is green. So I couldn't wash it. A very basic, no frills hotel at a great location. Had no issues with cleanliness and facilities. Free coffee and tea on every floor! For what you pay this hotel is good. Very central. Only quarm is the cleaning product they use stinks. The place is very clean, staff are friend. Stayed there for 3 days. After a day they transfered mo to another room which is the same standard room but with an almost non working aircon. I dont see the point of transfering us. They said they cant do about it and just offered a fan. Will never stay here again. Location was the best part of this hotel. It is near bars, restaurants, and the beach. I choose this hotel due to the nearby scuba diving shop. Room was satisfactory and air con did the job. Shower pressure was poor, no wifi in the room, and no elevator in the hotel. If you want a great location, this hotel will be suitable.